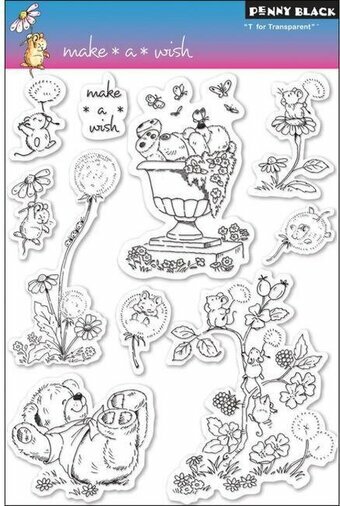 This collection of Penny Black Clear Stamps includes hedgehogs and the phrase "enjoy the little things". 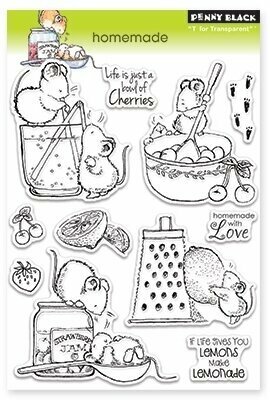 Penny Black clear stamps featuring kitchen scenes and the sentiments "If life gives you lemons make lemonade", "Homemade with love", and "Life is just a bowl of cherries". 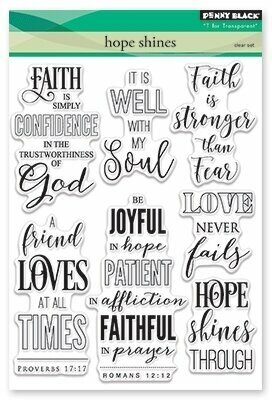 Christian themed Penny Black clear stamps featuring the inspirational sentiments "It is well with my soul", "Faith is stronger than fear", "A friend loves at all times - Proverbs 17:17", "Be joyful in hope, patient in affliction, faithful in prayer - Romans 12:12" and more. 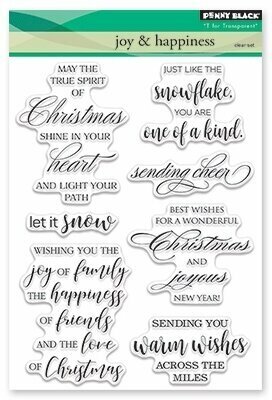 Christmas themed Penny Black clear stamps featuring "may the true spirit of Christmas shine in your heart", "let it snow", "sending you warm wishes across the miles", and more! Christmas themed Penny Black clear stamps featuring sentiments "joy joy joy", "snowflakes are kisses from heaven", "kindness is like snow... it beautifies everything it covers", and more! 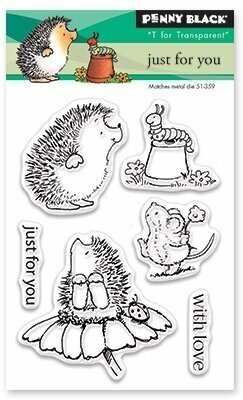 Penny Black clear stamps featuring a hedgehog, a mouse, "Just For You", and "With Love". 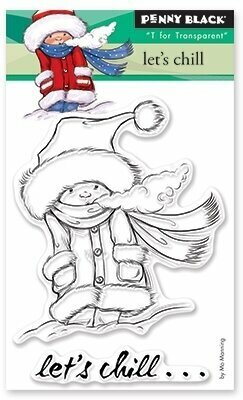 Christmas themed Penny Black clear stamp featuring a child bundled up in a winter coat. 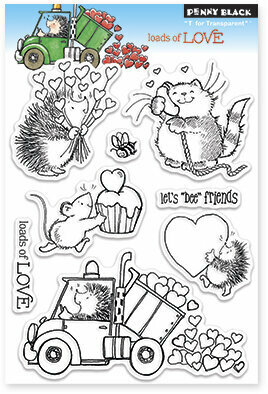 Love themed Penny Black clear stamps featuring hearts, hedgehogs, "Let's Bee Friends", and "Loads Of Love". 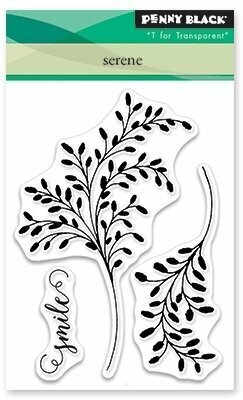 Penny Black clear stamps featuring flowers and a butterfly. From the Penny Black London 2012 Collection of rubber stamps and clear stamps, this set of clear stamps includes a double-decker bus. 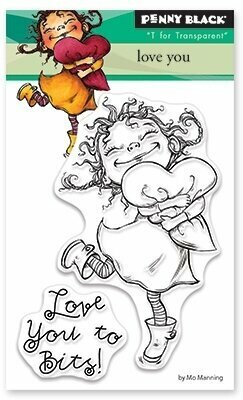 Love themed Penny Black clear stamp featuring the sentiment "Love you to bits". Penny Black clear stamp featuring birthday elements. 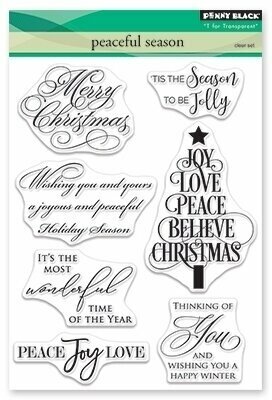 Christmas themed Penny Black clear stamps featuring a Christmas Tree, "Tis the season to be jolly", "Thinking of you and wishing you a happy Winter", and more. 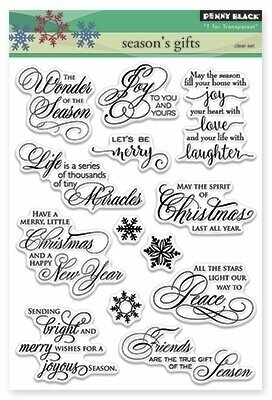 Christmas themed Penny Black clear stamps featuring the sentiments "The wonder of the season", "Joy to you and yours", "Life is a series of thousands of tiny miracles", "Friends are the true gift of the season", "Have a merry little Christmas and a Happy New Year". Penny Black clear stamp featuring sentiments to say "Thank You". 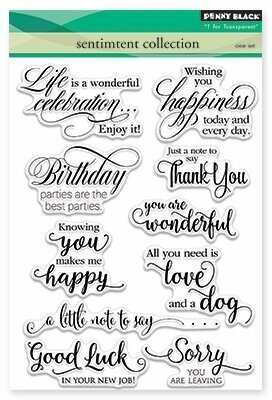 Penny Black clear stamps featuring the sentiments "Life is a wonderful celebration - enjoy it", "Just a note to say thank you", "Birthday parties are the best parties", "All you need is love and a dog", "Good luck in your new job", "Sorry you are leaving", and more. Penny Black clear stamps featuring the sentiments "Just A Note", "Thank You So Much", "Thinking Of You", "Happy Birthday", "Merry Christmas", "Happy Anniversary", "So Happy For You", "Congrats", "To A Very Special Person", "Enjoy Today Every Day", "Let Us Celebrate", "Have Cake And Eat It Too", "From Me To You", and "To A Very Special Couple". 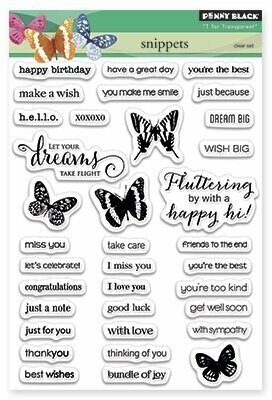 Penny Black clear stamps featuring butterflies and the sentiments "Happy Birthday", "Make A Wish", "Have A Great Day", "You're The Best", "Hello", "XOXO", "Dream Big", "Let your dreams take flight", "Fluttering by with a happy hi", "Miss You", "Let's Celebrate", "Congratulations", "Just A Note", "Just For You", "Thank You", "Best Wishes", "Take Care", "I Miss You", "I Love You", "Good Luck", "With Love", "Thinking Of You", "Bundle Of Joy", "Friends To The End", "You're The Best", "You're Too Kind", "Get Well Soon", and "With Sympathy". 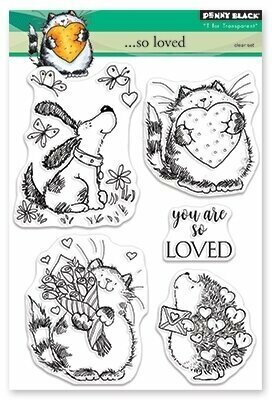 Love themed Penny Black clear stamps featuring cats, a dog, a hedgehog, and the sentiment "You are so loved". Christmas themed Penny Black clear stamps featuring Christmas Ornaments. 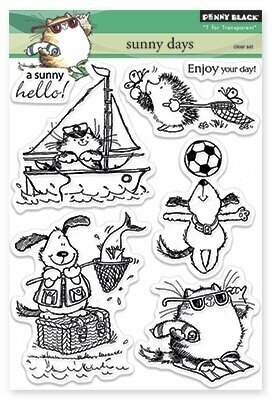 Summer themed Penny Black clear stamps featuring cats, dogs, a hedgehog, a sailboat, fishing, "Enjoy Your Day", and "A Sunny Hello". 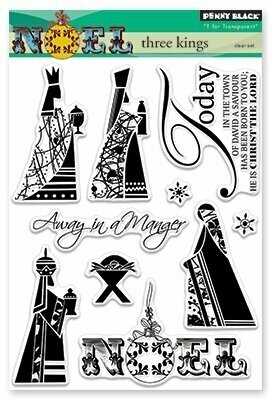 Christmas themed Penny Black clear stamps featuring 3 kings bearing gifts. 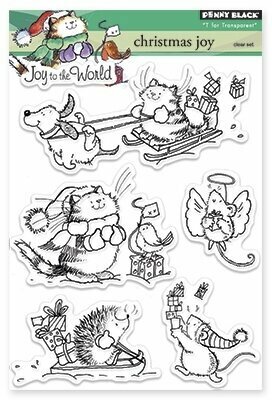 Christmas themed Penny Black clear stamps featuring a mouse with present, skating snowman, cats, and more! Valentine themed Penny Black clear stamp featuring a cute winged fairy holding a heart, and the words "Holding you" "close to my heart". 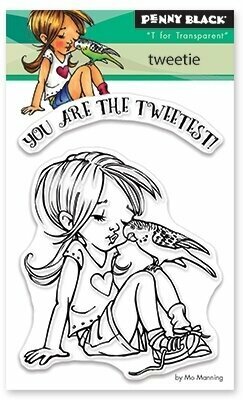 Love themed Penny Black clear stamp featuring a bird and the sentiment "You Are The Tweetest". 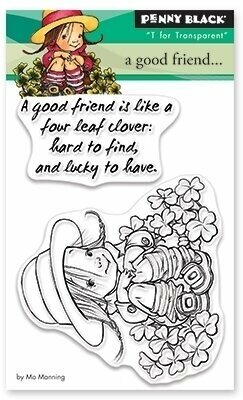 Penny Black clear stamp featuring the sentiment "A good friend is like a four leaf clover, hard to find and lucky to have". Penny Black clear stamps featuring a cat with the humorous birthday sentiment "A little bird told me how old you are, so I ate it". A set of Penny Black clear stamps featuring flowers and the phrase "Too much of a good thing is wonderful - Mae West". Penny Black clear stamps featuring a sheep, a bee, a deer, a swan, and the sentiments "Thanks bee to thee", "Sorry to hear ewe had a baaad day", "Oh deer, I'm so sorry", "Have fawn on your birthday, deer", "Just swan-dering how you're doing", "Happy bee-lated birthday", and "You're swan-derful and sweet". 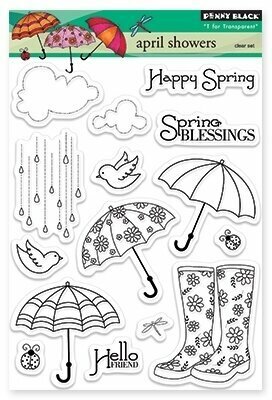 Penny Black clear stamps featuring umbrellas, clouds, rain, boots, "Happy Spring", "Spring Blessings", and "Hello Friend". 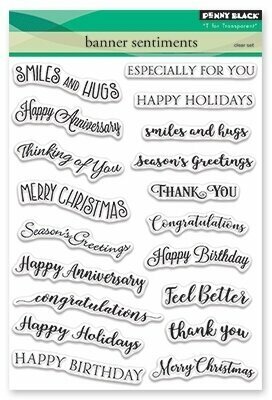 Penny Black clear stamps featuring the sentiments "Happy Anniversary", "Thinking of You", "Merry Christmas", "Thank You", "Congratulations", "Feel Better", and more. Penny Black clear stamp featuring the motivational sentiments "Be" "classy" "brave" "bold" "glamorous", and "yourself". 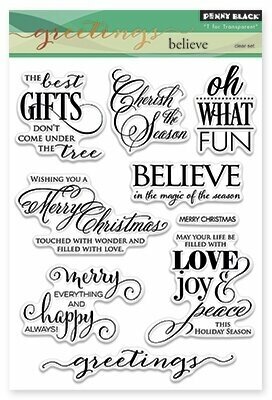 Christmas themed Penny Black clear stamps featuring the sentiments "The best gifts don't come under the tree", "Cherish the season", "Believe in the magic of the season", "Merry everything and happy always", and more. 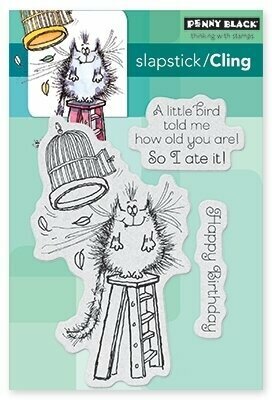 A collection of Penny Black Clear Stamps featuring Mimi celebrating a birthday. 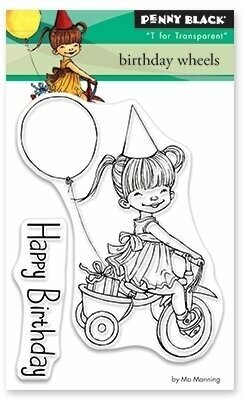 Penny Black clear stamps featuring a girl riding a tricycle, and the sentiment "Happy Birthday". Travel and vacation themed Penny Black clear stamps featuring a hot air balloon, an airplane, a sailboat, a scooter, a camper, "Are we there yet", "Up up and away", "Bon Voyage", "The sky's the limit", and "Happy Camper". 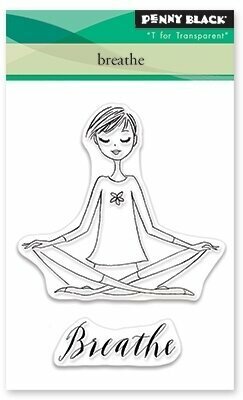 Penny Black clear stamps featuring a woman meditating, with the word "Breathe". Penny Black clear stamp featuring a little girl riding a tricycle with her teddy bear. 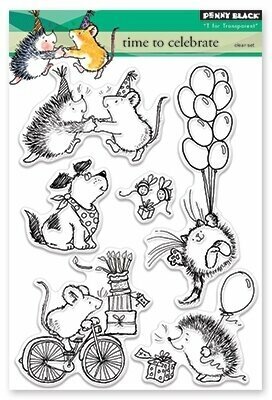 "Birthday dreams do come true"
Penny Black clear stamps featuring Christmas scenes with a cat, a dog, a hedgehog, and a mouse. 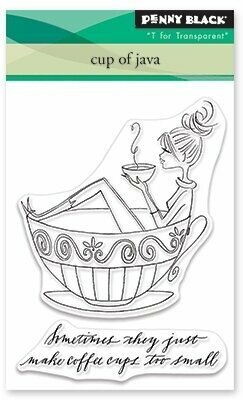 Penny Black clear stamps featuring a very large coffee cup and the humorous sentiment "Sometimes they just make coffee cups too small". Penny Black clear stamp featuring a little boy wearing his Daddy's shoes.